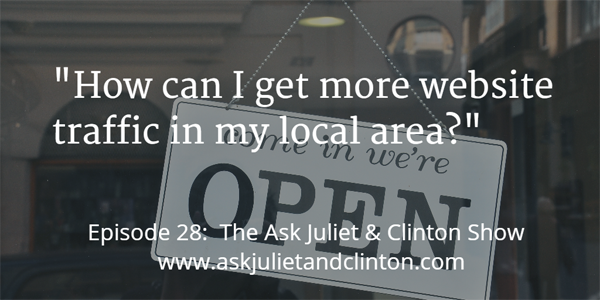 How can I get more website traffic in my local area? “Hi Juliet and Clinton. 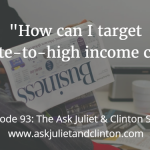 I’m so glad I’ve discovered your podcast – I look forward to every episode – you’ve helped me so much already with your tips and advice! What do you think of practitioners offering a free 30-minute consultation to new clients? 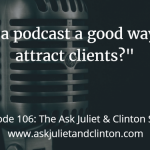 Good marketing to give something for free, enable clients (and therapist) to make sure you’re a good match, or do you think this strategy ‘cheapens’ ones brand? “Hi Juliet and Clinton. I’ve just found your podcast and have listened to every episode in a few days – I love your sense of humour and facts about Australia and Canada! I have a newbie question that I hope is not too basic for you. I am a certified Reiki Master and have been in business full time for about 4 years. I have never used social media to market my practice and I want to get started. 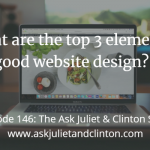 Episode 146: What are the top 3 elements of good website design? 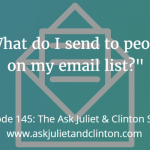 Episode 145: What do I send to people on my email list?